The Ontario Community Newspaper Association [OCNA] has declared the North Grenville Times as the second best website for newspapers with a circulation of up to 10,000 in Ontario. 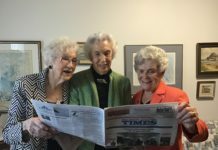 In the OCNA’s 2018 Better Newspapers Competition, the Times ranked behind The Manitoulin Expositor, a venerable newspaper and Northern Ontario’s oldest newspaper, based at Manitowaning on Manitoulin Island, which repeated its win of previous years. The award comes in the Premier Awards section, and this was the first year the Times had entered the competition. Third place went to the Parry Sound North Star, a paper in the Metroland chain.